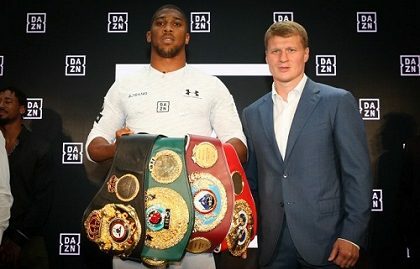 World heavyweight champion Anthony Joshua faces his most dangerous challenge to date when putting a clutch of titles on the line against big-punching Russian brawler Alexander Povetkin, but the pre-bout betting would suggest the outcome is a foregone conclusion – another AJ win. Backers looking to support the Englishman at Wembley on Saturday evening will be forced into the specials markets after finding the Joshua vs Povetkin best fight odds to be around the 1/9 mark for a successful defense. Thankfully for backers, there’s more to get excited about if taking a chance on the underdog who has been chalked up at 7/1. That quote suggests winning isn’t an option for Russian Vityaz, but we know that’s not the case. Boxing is famous for providing an upset and the sport did just that only last week when Saul Alvarez beat Gennady Golovkin in Las Vegas. So, what are the chances of Povetkin spoiling the party? These two fights show what the 39-year-old brings to the table. Saturday will be Alexander’s second visit to these shores in two fights, having knocked Englishman David Price out cold on the undercard of Joshua – Parker in Cardiff earlier this year. In this thrill-a-minute contest, both men received a count during an action-packed third round but Povetkin held his nerve, delivering a stunning overhand right in the fifth to level Price. Such was the ferocity of the punch referee Howard Foster immediately called on the ringside doctors, deciding the ten count was a pointless exercise. A perfectly delivered power shot but it would’ve come as no surprise to those who have followed the victor’s career to date. In his previous 35 outings, Povetkin has won 34 times with 24 of those coming inside the distance. Another KO/TKO has been deemed highly unlikely by traders; William Hill advertising 8/1. The only bout Povetkin has lost so far and there’s certainly no disgrace in that, given what Dr Steelhammer achieved in the game, running the highest weight category for many years. When faced with an opponent standing 6ft 6inches tall and build to inflict serious pain on rivals, Alexander was always going to struggle, but he shook off the expectations of most and remained upright until the final bell, making him one of only a few men to go the distance with Wladimir. The final scores – 119-104 on all three cards – explains exactly how the night went but the beaten man proved his bravery and chin when hauling himself off the canvas four times, including once as early as round two. To see the bout out shows the determination that the challenger carries and he’ll be confident of asking Joshua all the right questions in front of his own fans. The fight to go the distance is 11/4 with most firms, Povetkin to be knocked down at any point 1/4 and this bill-topper lasting more than 6.5 rounds is 8/15.